Ferndale is located just off I-5 at exit 262 on the scenic Nooksack River. With a population of around 14,000 it’s a community of diverse friends and generational families. The area hosts very pleasant summers and a variety of activities to enjoy. From a short drive to Mt. Baker to a local Festival this area is one that you will never want to leave. We encourage you to come, look around and stay a while. Welcome to our home. 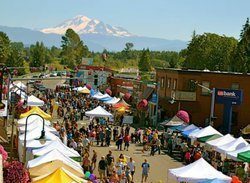 Featuring live music from around the area, the Annual Pie Eating Contest, Ferndale’s Kid’s Street sponsored by McDonalds, Festival of Fenders Car Show, Delicious food from around Whatcom County, and local vendors.